Sometimes when you have much creative ideas to write on your blog post, you will have long words to tell the readers. 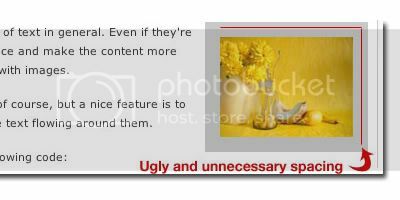 So, whenever your visitors landed to the front page of your blog, they need to scroll down a bit more. The consequence is that probably you can only have limited recent posts at the front page. Today's CSS tutorial review is very famous actually! WebDesignerWall.com brought you a quick tutorial to implement CSS Gradient into text. This CSS trick can be extended into many kinds of gradient text effects. For you who missed the chance to read this following tutorial, this CSS is worth to try! This CSS gradient effect works on most browsers. As IE is an evil for CSS, PNG hack is required in IE6. Adding text next to your image, is a bit tricky. Sometimes the text won't flow nicely around the image. So you will need to have correct classes to float the image in CSS. Thord Daniel Hedengren of Devlounge.net wrote a simple tutorial that will show you how to align images using CSS in the right way. In this tutorial you will also learn how to add the frame class in order to have a nice looking border around your images! Today's CSS review is about CSS popups effect. 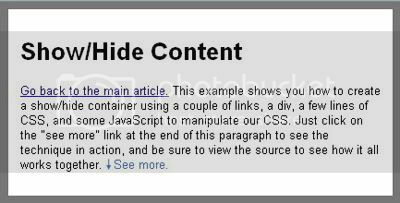 This CSS will make images to appear and disappear on links mouse over. A neat way to drive reader's attention with icons, text or some decorative elements on rollover state. I've been so busy lately and being left behind just to write a tutorial or to design another freebies. So, maybe it will be nice if I start to write series of short review about CSS from other websites this week. Hopefully I would be able to bring them to you daily! Subscribe to Graphic Identity Blog to follow the fresh news of CSS tips and tricks today! A box with a drop shadow, border and gradient. 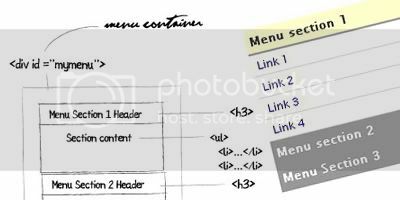 You will need Photoshop or another graphic design software to create those nice CSS boxes. These boxes are so cool because they are also expandable in some heights. Experiment with your own box color and round corner radius! It will be great for a start. Today's gallery is to showcase 5 Artistic Graphic Designer's Blogs. Unique layout composition is what make them stand out. Each of them is presenting creative graphic design masterpiece work of talented hands. Designed by Doug Cloud. He is a freelance graphic artist. You will see cartoon illustration style everywhere on his blog. Interesting stuff because he also starts series of Drawing Lesson using Photoshop and Illustrator. Another thing that I love from this blog is the Comic Strip category. You may need subscribe to Doug Cloud's Blog so you won't miss the next drawing lesson and comic strip post! It's been more than a month since the last Free Design Box post category. Now I want to give you something different. 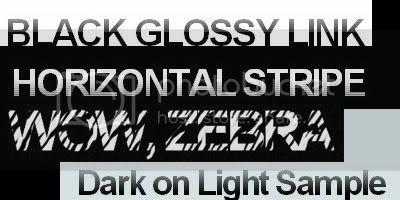 Today's post is about Grunge RSS Banners. I have 6 different colors of RSS Banners. But the interesting part is, I designed them based on three resources of super famous freebies. I am really thankful to Franka, Sarah and Bittbox for such wonderful freebies ever. 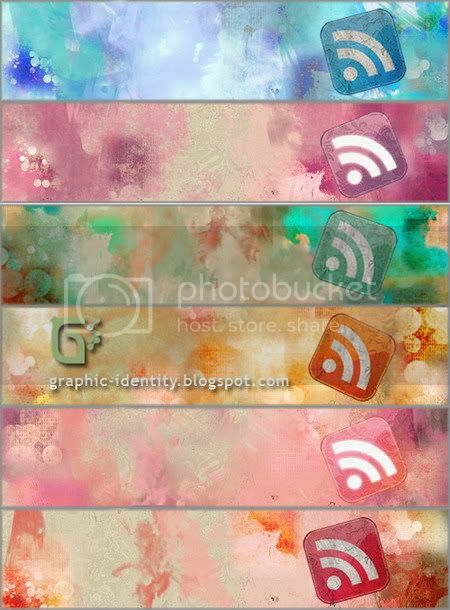 I was just doing a retouch to create grungy water color look for each banner. Sarah's grunge textures works beautifully on water color brush background by Bittbox. It was fun composing them together in a blend of layers. I was just replacing color for some banners in photoshop, so they result in 6 different colors. These banners are in .PNG format, just extract the .ZIP file and they are set. I let each of them in 600x135 pixel blank banner template, to make easier for you to customize it with your own typeface choice. 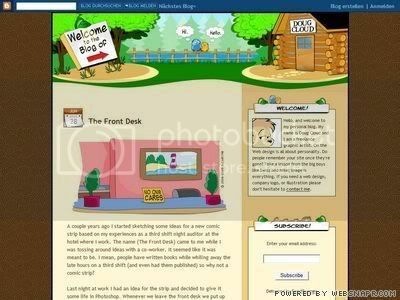 Just resize it to fit on your blog layout! I will appreciate credits whenever you use this banner. Please comment and spread out this post if you like! These are absolutely free for you and you can subscribe to Graphic Identity Blog in feed reader or by email for next updates! Please read: Legal Usage to employ Graphic Identity's 'Free Design Box' files before download. Share the permanent post link by copying this code to your blog, thank you!